The don’t like each other but have no choice but to deal with it. They are neighbors and forced partners. 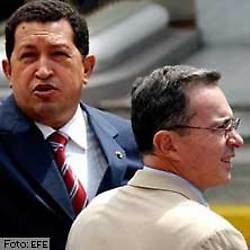 They both have autocratic tendencies (although Uribe is in nowhere near the same dicto-league as Chávez). In sum, they are the yin and yang of Latin American presidents. Where Chávez is mercurial, Uribe is cerebral. Where Chávez is anti-yankee, Uribe is Washington’s best friend. Their regular kabuki dance consists of months of nothing happening, with smiles and hugs and seemingly normal bilateral meetings. Then, something happens and one of them goes off the handle. After that, the Colombian government usually cools things by, say, leaking sensitive information on Venezuela or toning the rhetoric down, and everything goes back to normal. Haven’t we seen this a thousand times before? What’s to think that this latest made-up telenovela (“Americans in Colombia! The horror!“) is going to end any differently? But here it is, another bilateral scandal taking up valuable space in the headlines, distracting our attention from more pressing issues, knowing how it is all going to end – in nothing. Their mutual co-dependence is much more important. Post 56 of 100 … are we there yet?